Consider Adopting a Dog & Save a Life! Looking for a new furry companion. Have you considered adopting a dog? Animal shelters are bursting at the seams with homeless dogs and cats who end up there through no fault of their own. They are waiting for you to come along a give them a “forever” home. According to the ASPCA of the 8-12 million animals who enter shelters every year approximately 5-9 million cats and dogs are euthanized because of lack of homes. Looking for a specific breed? Up to 25% of shelter dogs are purebred . Death or illness of an owner: Often when an owner dies or is placed in a nursing facility there is no other family member who wants to take care of the pet. Change in owner’s financial or living situation: The owner can no longer afford the upkeep or is moving to a new apartment/living situation and pets are not welcome. Buyer’s remorse: Adopting an animal seemed like a good idea at the time. Pets are a big commitment and once the responsibility that comes with pet ownership sets in the new owner gets cold feet. Behavioral problems: Every new dog owner should take a basic obedience class with their furry friend. Pet gets lost: Every pet should be micro chipped. That way if the animal does get lost and end up in a shelter the staff can scan the chip and locate the animal’s owner. If you are thinking about adopting a dog or other homeless animal you have several options. There are municipal or city shelters. 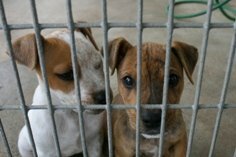 Animals in these facilities are at the greatest risk of being euthanized due to the need to make room for new arrivals. Private or non-profit shelters are usually smaller and frequently no-kill shelters, but can handle far fewer animals than the larger municipal facilities. Finally, there are rescue groups. These are often breed specific and run by dedicated volunteers who give unselfishly of their time and energy to find good homes for dogs and other animals that would otherwise be abandoned and/or euthanized. Depending on the individual shelter or rescue group the procedures for adopting a dog may vary. Expect to fill out an application and answer some questions. The shelter staff wants to make sure that you are prepared for the responsibilities of pet ownership. They also need to be sure that you and your dog of choice are a good fit. Getting adopted and then returned to the shelter is one of the most traumatizing things that can happen to a shelter dog. Here are some of the questions that you will likely be asked. Do you rent or own your home? If you rent be prepared to provide a copy of your lease and documentation that animals are allowed. Do you have children? How many? How old? How many hours a day will the animal be left alone? You should also be prepared to ask some questions. Before you visit your local shelter think about what it is you are looking for in a dog. Check out our tips for a successful adoption.